Polish class Ty2 is the old German War locomotive, Kriegslok Baureihe 52. 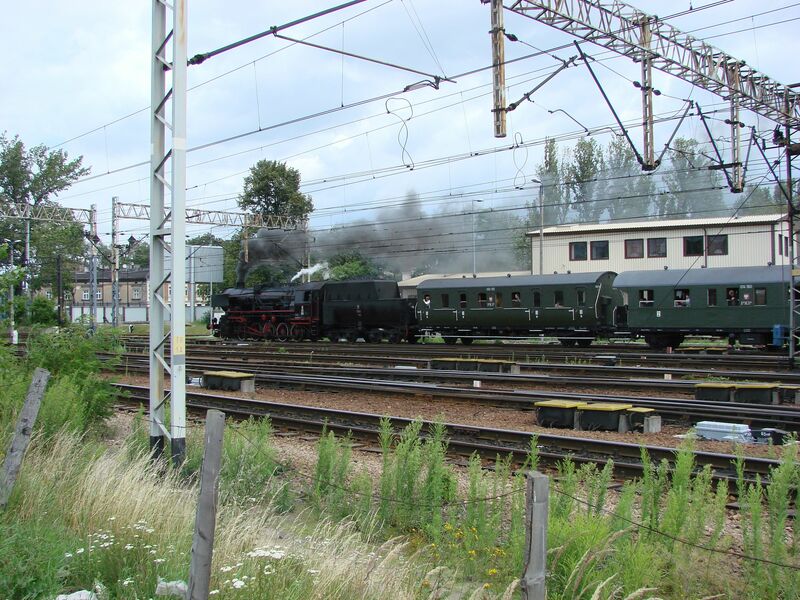 Here one of the old war locomotives is pulling a train consisting of purely pre-WWII German coaches. This was a historic special train. Picture from Krakow Glowny 7.7.2007 by Ilkka Siissalo. Same train as in the picture above. Picture at Krakow Glowny 7.7.2007 by Ilkka Siissalo. Another Ty2 alias German Br52 Kriegslok. The design of the cabin shows that this is one of those war locomotives built late during the war which were intended for the extremely cold temperatures of the Russian winter. The cabin is closed at the back and coupled with the "Wannentender" (bath tub tender) in such a way that the cold air would not freeze the drivers. This individual was built by F. Schichau GmbH, Maschinen- und Lokomotivfabrik, Elbing in 1943 and it used to be the German DRB Br52 no.2277. It went to MAV in Hungary as MAV 52 2277 in 1945 and then to Romanian CFR in 1948 and was then taken over by the Russians in October 1950. Russians called it TE 2277. Polish PKP got it in 1963 and used it among other places in Gdynia, Gdansk and Chojnice until 1990 until some kind of an explosion damaged it. It was listed as excess inventory in 1992. Picture at the train scrapyard of Chojnice 5.4.2017 by Ilkka Siissalo. 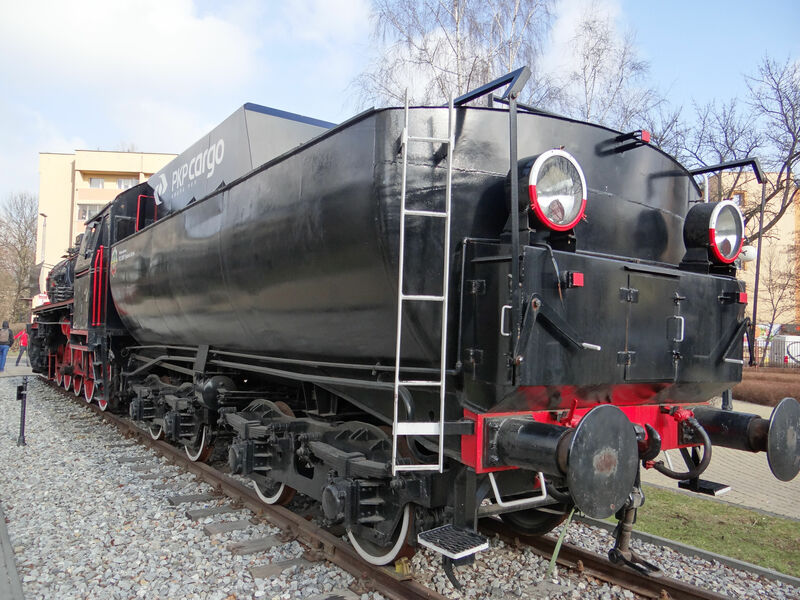 Another PKP Ty2 or formerly German war locomotive Br 52 stands beautifully restored on the campus of AGH, the university of science and technology in Krakow. PKP Cargo had financially supported the restoration of the engine. Picture at AGH campus in Krakow 7.3.2015 by Ilkka Siissalo. 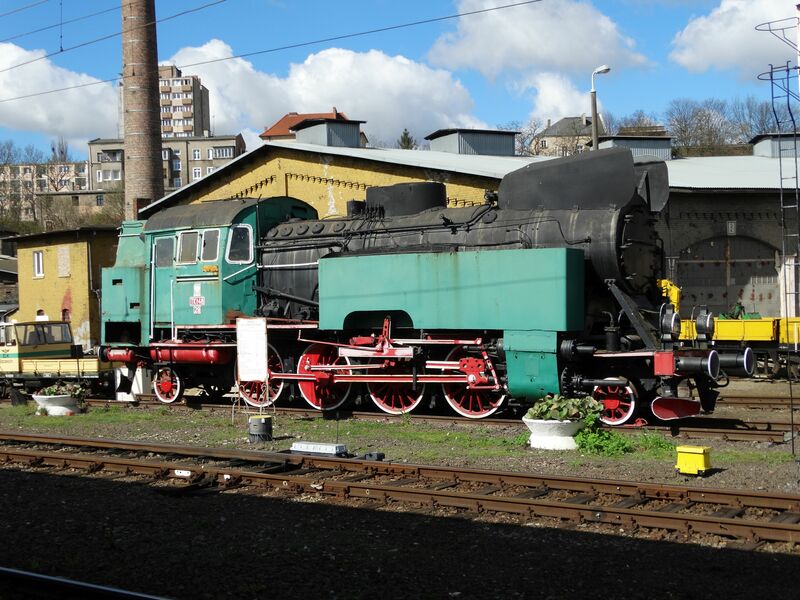 The Wannentender (bath tub tender) of the war locomotive at AGH campus in Krakow. Picture 7.3.2015 by Ilkka Siissalo. 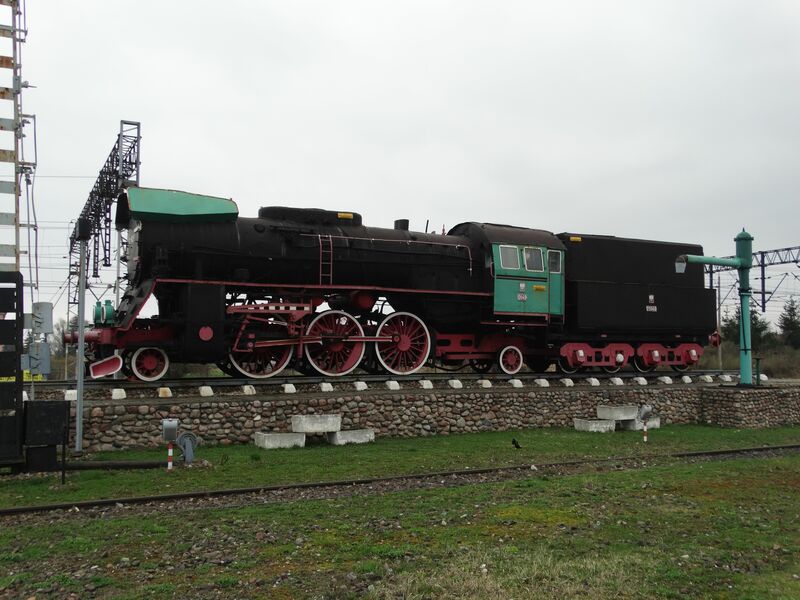 This old class Ol49 steam locomotive has been kept as a monument of old times in Korsze, along the line of the famous German "Ostbahn", east railroad, which used to link Berlin with Königsberg. Now when the Königsberg area is annexed by the Russians as their Kaliningrad enclave, the main line is fairly quiet. The class Ol49 was developed by Fablok in Chrzanów in 1949 based on earlier German designs. Fablok built 115 of them during the years 1951-54. Top speed of the machine was 100 km/h. Picture at Korsze station 3.4.2017 by Ilkka Siissalo. Another view of the same Ol49. Picture at Korsze station 3.4.2017 by Ilkka Siissalo. 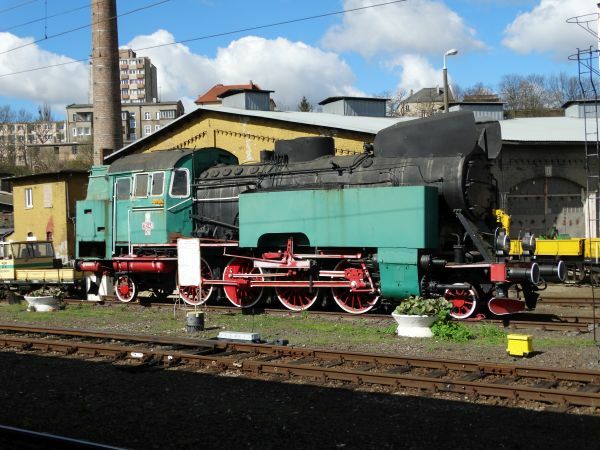 This old class TKt48 shunter locomotive has been left as a monument at the Szczecin glowny (Stettin main station). 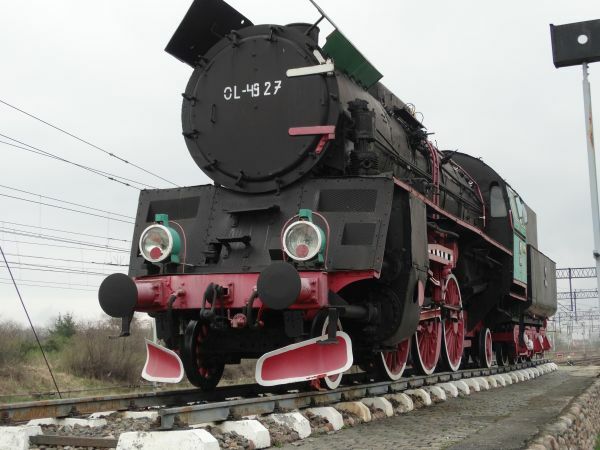 It was built in Poznan in 1951 and it was in use in Szczecin until 1991. Picture at Szczecin glowny 6.4.2017 by Ilkka Siissalo. 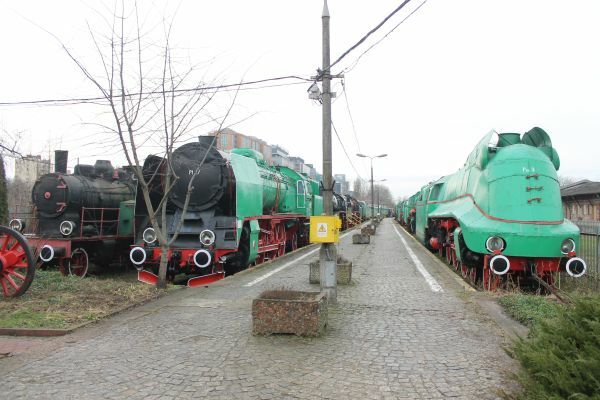 This picture is from the railway museum in Warsaw. The large steam engine on the right is a German Baureihe 03 machine with aerodynamic coating plates. In the 1930s before the war German railways tried their best in improving the speed of fast trains. 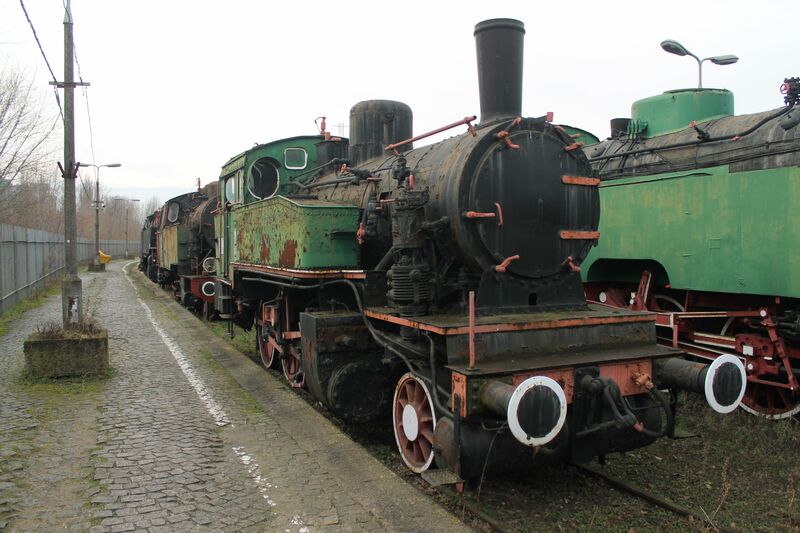 Some machines of the express train steam engines of classes 01 and 03 got totally covering aerodynamic platings. But soon it was discovered that coatings covering the machines' wheels were a problem since the wheels of that time engines had to be oiled often and the cover plates made this very difficult. This is one of those few class 03 machines that got new, modified aerodynamic coating plates which left the wheels uncovered. 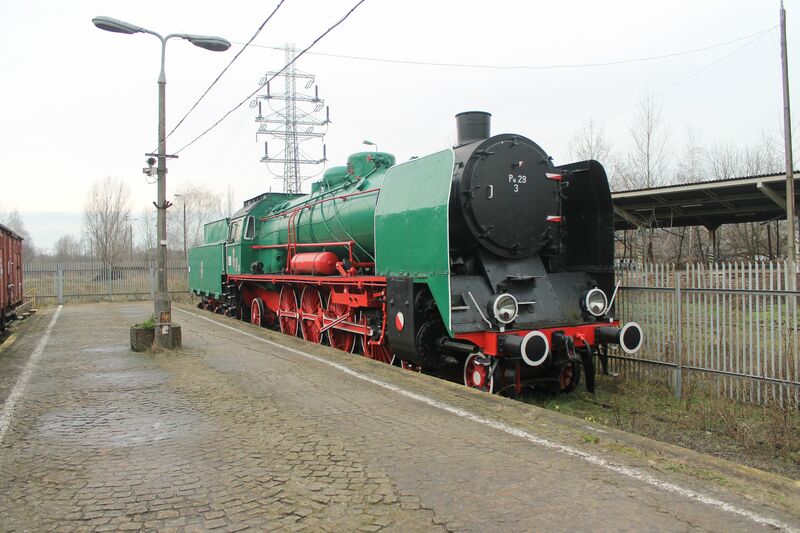 It had been left behind by the Germans when German army had to retreat from Poland and it had been taken over by the Polish state railways which gave it a new class designation Pm3 instead of the original Baureihe 03 or Br 03. 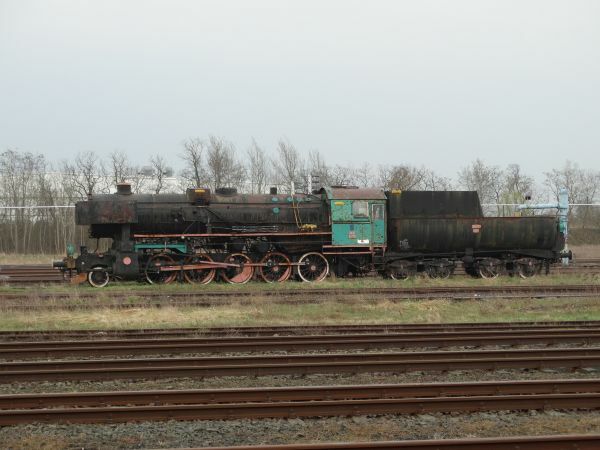 The machine in the middle resembles very closely pre-war German machines, but it is actually a Polish construction called class Pt47. They were built 1948-1951 by Fablok and Cegielski in Poland. A total of 180 machines were built. It was a 110 km/h fast 2-8-2 construction with an axle load of only 18,7 tons. It very closely resembled the German Br 03. The machine on the left in the picture is unidentified. Picture by Timo Varshukov 28.12.2017. Another view of the German Deutsche Reichsbahn Gesellschaft DRG Baureihe 03 with a modified aerodynamic coating, alias Polish PKP Pm3. The Polish class Ty51 was built by Cegielski in Poland 1953-58. It was a copy of a US locomotive named Ty246 or ALCO 75500 "Truman". 232 copy machines were built in Poland and the last ones were in use in Silesia (Schlesien) until 1993. In the background Oi1 no 29, a German or actually Prussian old locomotive, originally a Prussian class P 6 machine from sometime between 1902 to 1910. It was known in pre-war Germany as the Deutsche Reichsbahn Gesellschaft Baureihe 37.0. This one is a real rarity. 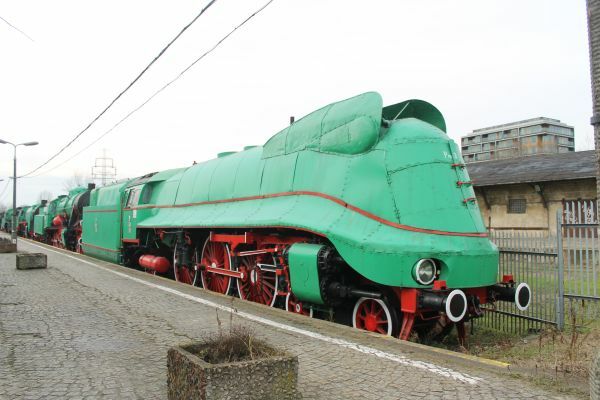 Cegielski in Poland built in 1931 only three copies of this passenger express train locomotive type PU29. When war broke out and Russians invaded half of Poland and Germans the other half, one machine ended up in Germany where the Germans redesignated it as DRG Br 12.2. Two others were stolen by the Russians, but then when the German-Russian war broke out, the Germans soon captured both from the Russians. At the end of the war one ended up on the western zone of Germany, where it was soon scrapped. The Germans scrapped no. 2 already during the war, but this no.3 ended first up in Czechoslovakia where it served at the state railways ČSD, but the Czechs gave it back to the Polish in 1949. It was in use until 1970 and has been a museum exhibit ever since. 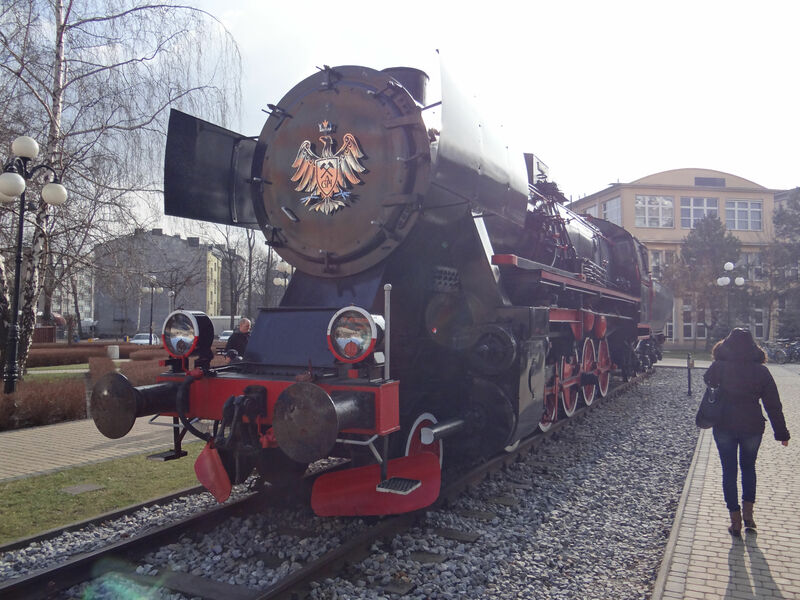 This machine is a Prussian local train engine. 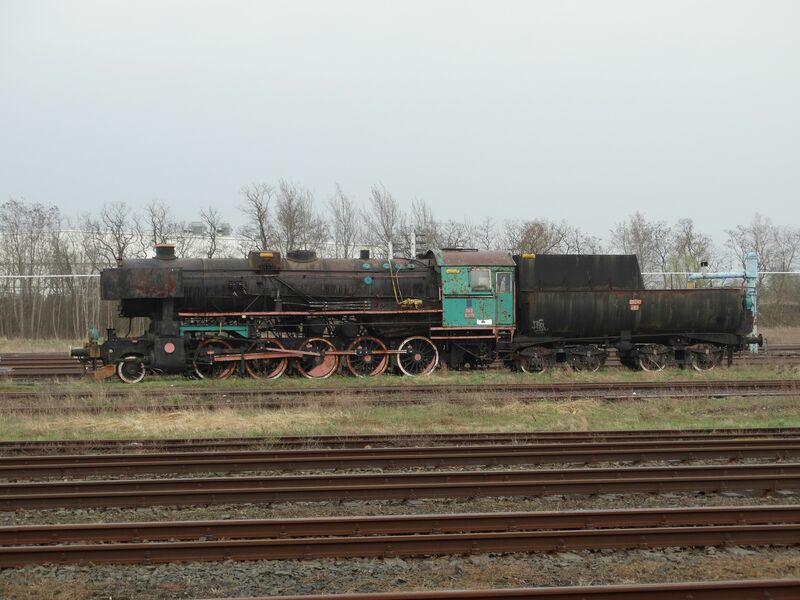 In Poland, after Poland took over part of the former German East Prussia this was designated as the PKP class TKi3, but originally it was a Prussian class T9.3. It was once a common machine. 2052 copies were built for the Prussian state railways 1901-14. Even after the war in 1945 in their first Polish inventory, PKP counted they had 236 of these machines. Many more were left on the East Prussian territory now occupied by the Russians and some served in the Baltic states during their Russian communist rule. 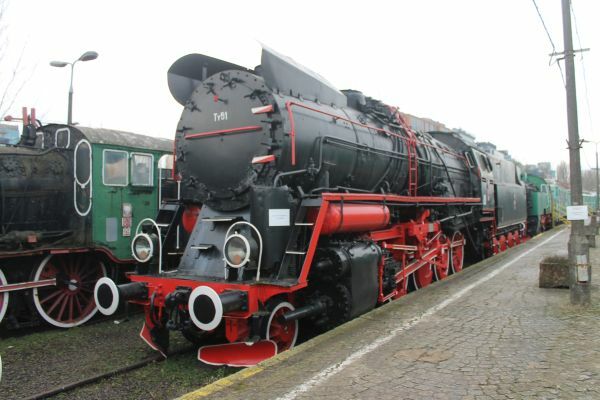 Deutsche Reichsbahn Gesellschaft called this type their Baureihe 91 and in Austria it was known as their Baureihe 691. Most examples were taken out of service by the beginning of the 1970s. It was a 65 km/h fast tank engine intended both for cargo and passenger trains.